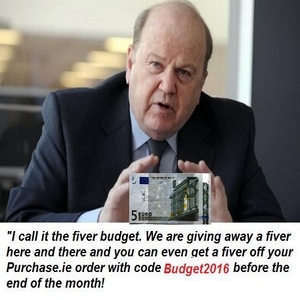 Within minutes of Michael Noonan addressing the nation to announce details of the budget on Tuesday Oct 11th many commentators were referring to it as the fiver budget. This of course was due to the announcement that pensioners and others that receive welfare benefits would get an extra 5 Euro a week. The extra 5 euro is of little comfort to people that drive and have seen their insurance renewal quotes double in recent months. For most the €260 a year (€5 x 52) will not even come close to covering this increased insurance cost. In any case we decided it would be nice to reward our own loyal customers with a special offer of our own based on the fiver budget. Get €5 off your order when you use the code Budget2016 at checkout when ordering online before the end of the month of October. Alternatively call us on 066 71 36 486 and mention the budget to us and we will gladly process your discounted order for you over the phone. So start shopping and saving!